I’m so excited this morning, because HeavyWeight Yoga is stretching out to embrace new students. This morning the TV news shows in Houston (Great Day Houston) as well as in Austin (Good Day Austin) featured segments to show off HeavyWeight Yoga and my newest DVD. On KHOU in Houston, we even introduced two local HeavyWeight Yoga teachers. In Houston people saw me practicing with fitness reporter Courtney Perna at the classic Heights Branch library as part of her Channel 4 broadcasts Think Outside The Gym. On that show I was joined by two Houston-area HeavyWeight Yoga instructors, Lea Ann Deel (heavyweightyogahouston.com) as well as Rowan Twosisters, who’s integrated my HeavyWeight Yoga with her Hottie Hoop Camp. But if you’re not able to make that 3-Sunday series that Lea Ann offers in the Houston area, you can also sign up for my next HeavyYoga Women’s Retreat, May 22-24. If you can’t make my retreat event (so very special, and close to Houston — plus you get $100 off registering early) you can practice with me using my newest DVD. Being in a class or a retreat space is a wonderful way to begin. Whenever you want to practice, I’m there for you, on any of my three DVDs. Lea’s Houston classes start this Sunday, Feb. 22, at Niamoves. Register with her at the studio’s website. In Austin, the local Fox TV affiliate Channel 7 just ran three reports on HeavyWeight Yoga here on President’s Day. It was great to wake up to yoga on my screen. But that’s something everybody can do with my DVDs, too. I want to connect to you any way that I can, either on the screen, in a retreat, or with a HeavyWeight Yoga teacher in the room with you. My Austin classes meet on Mondays, Wednesdays, Thursday and Saturdays. After my Wednesday evening classes here in Austin, I’m out on a trip to see my niece Megan get married over this coming weekend — but I’ll be back next week starting Wednesday (Feb. 25) for a full slate of my local classes. I hope I’ll see you on the mat with me! Send me a comment with our Contact Form. I was thrilled to be interviewed for the Houston TV station KIAH this week, the CW39 channel. 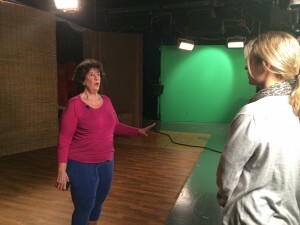 Not only did I get to show the city’s viewers the latest from the Heavyweight Yoga 3 DVD, two Houston-area teachers that I’ve trained got their moments in front of the camera as well. Rowan and Leah expressed themselves with passion and spark. They’re great representatives of the Heavyweight Yoga teachings. The CW39 has a very unique news hour. Newsfix is full of one- and two-minute stories, and it’s got a great sense of humor. It’s news that pitched for the younger viewer. It’s got an app where you can see its stories, and Courtney and the crew there at the station were gracious with their time. Heavyweight Yoga got its due thanks to their work. Being on Newsfix was an example of how yoga’s gotten into the mainstream conversation by now. People want to get the word out. It feels like interest is higher than ever. When I look back over the 42 years that I’ve practiced and taught yoga, it’s gone from something for hippies and cult activity, to a genuine lifestyle choice. Yoga is everywhere. It’s available to anyone who wants to try it, use it, and love themselves. I told Courtney while I was on camera that making changes in your life is only possible from within. When you love yourself, that’s the best way. Here comes the latest DVD! I’m so excited! We’ve stocked up the latest DVD today, HeavyWeight Yoga 3: Five x 25. We’ve put it up for sale at all of our outlets — the new shop at Sears.com; as always, Amazon; and of course our own online HeartFelt Yoga.com outlet. (Shipping at HeavyWeight Yoga.com is FREE.) I have so many people to thank for making my dream come true. But most of all, I want to thank my students. Whether you practice with me using the DVD in your home, or you have been to a retreat or inside my Austin studios, you’re the ones who teach me, so I can spread your courage and spark. Of course, the great thing about doing three DVDs is you learn more about what people need with each one. People love the first two (sorry if I brag there.) Now my latest helps people who don’t have a lot of time to practice, but want the benefits that yoga brings for them. You’ll love this list: Increased mobility and flexibility. Decreased stress and lower blood pressure. Body detoxification and improved elimination. Muscle tone and joint lubrication. The list of yoga benefits goes on and on. As science improves it has come to validate what people for thousands of years have known instinctively: Doing yoga makes you feel better. Join me on the newest leg of our journey to health together. And please, let me know in your comments here, and in your reviews on Amazon and Sears, how it’s helping you — and how I can serve you better in the years to come. I honor the light within you.